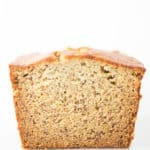 Easy Gluten-Free Irish Soda Bread Recipe. 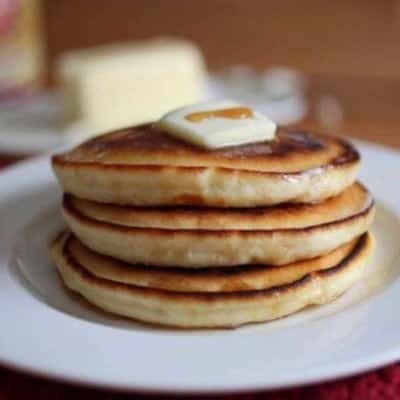 Made with gluten-free flour, buttermilk, an egg, and a little sugar. 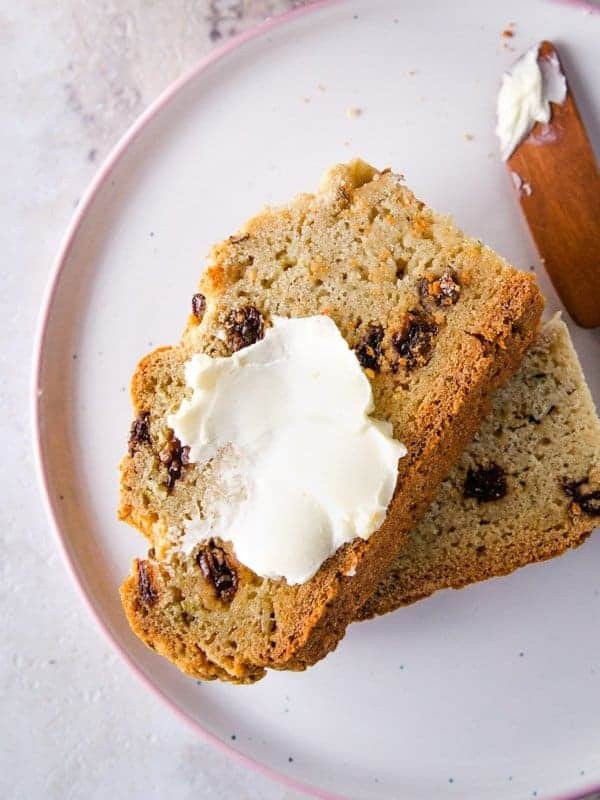 Raisins and caraway seeds optional! 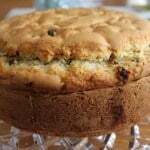 Years ago I created a recipe for gluten-free Irish Soda bread. I love that recipe. Many other folks love that recipe. So why am I posting a new take on this classic? Two reasons: the pan and the flour. That recipe calls for a springform pan—which is great if you own one. However, if you don’t, it’s silly to buy one to make a simple loaf of Irish soda bread. This recipe only requires a sheet pan and a piece of parchment paper. Now, about the flour. Gluten-free flour is always an interesting topic. 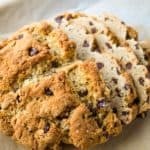 Years ago when I started sharing gluten-free recipes, gluten-free flour blends were hard to find. Good gluten-free flour blends were even harder to find. That isn’t the case today. There are many good blends on the market. And while they all behave differently, there are several that work very well. For this soda bread, I used my favorite blend, Bob’s Red Mill 1:1 Gluten-Free Baking Flour. (Not sponsored. I just like the blend.) If you prefer to use your own blend, replace it with the flour called for in this recipe. The only thing you don’t want to do is replace the flour with a nut flour. That won’t work. Cut cold butter into the flour. 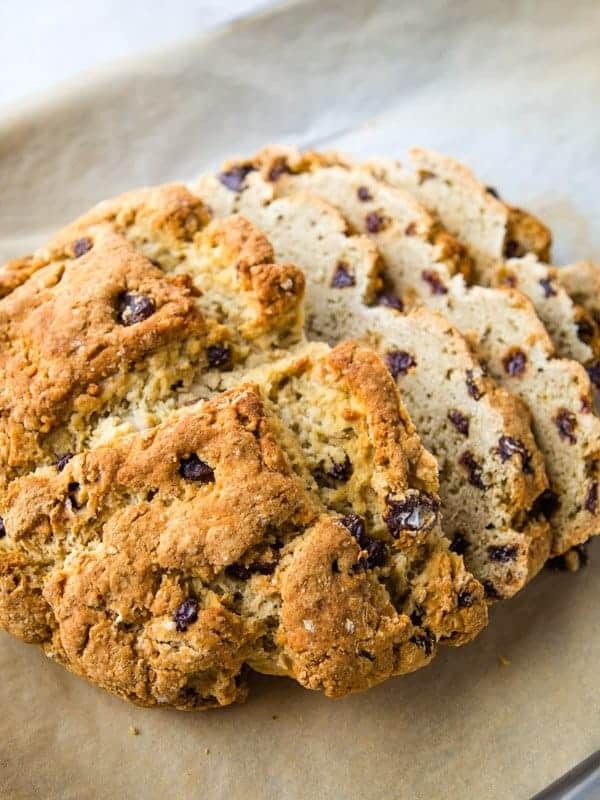 Think of Irish soda bread like a giant scone or biscuit. 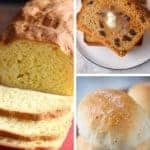 The dough is nothing like gluten-free sandwich bread. At all. First, it doesn’t contain yeast. It’s leavened by baking soda, hence the name “soda bread.” Second, you start by cutting cold fat, in this case, butter, into flour. To do this, use a pastry cutter or your hands until no large pieces of butter remain. If you want to use your hands, work the butter into the flour by using a snapping or rubbing motion. Stir in Raisins and Caraway Seeds. 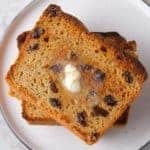 Once you’ve cut in the butter, add the raisins and caraway seeds. 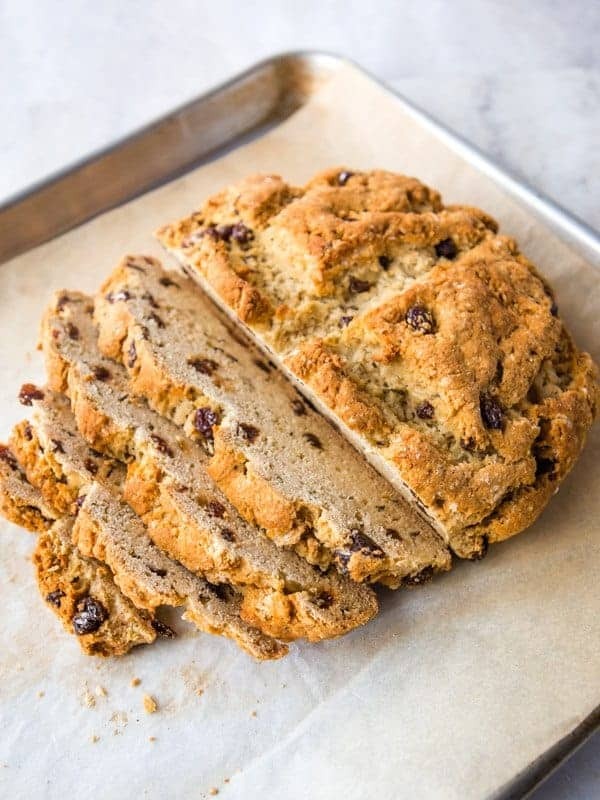 Traditional Irish soda bread contains neither of these ingredients but the American take on soda bread does—along with a hint of sugar. If you don’t like caraway or raisins, feel free to omit them. The recipe works just fine without them. Shape. 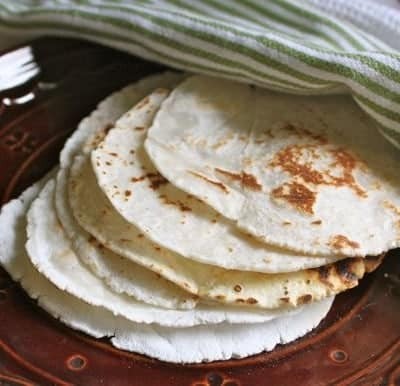 Turn the dough onto a parchment-lined baking sheet. Pat into a round loaf, about 10-inches across. Then, using a sharp knife, cut a cross in the top of the loaf. This allows steam to escape and helps the loaf cook evenly. Bake. It feels like this loaf takes forever to bake. ForEVER. Check it after 45 minutes. Gently press on the center. It should feel firm, not doughy. If the top of the loaf browns before the center bakes, cover it with foil. Once the loaf cools a bit, cut with a serrated knife. It has a delicate texture and mild, sweet taste. Whisk together gluten-free flour, sugar, baking soda, baking powder, and salt in a large bowl. Cut in cold butter with a pastry cutter or your fingers until no large pieces of butter remain. Stir in raisins and caraway seeds. Add buttermilk and egg. Stir until a dough forms. If the dough seems dry, add additional buttermilk, one tablespoon at a time until dough holds together. Pat dough into a round. Place on prepared baking sheet. Cut a cross into the top of the loaf with a sharp knife. Bake until center is set and loaf is golden brown, about 45 minutes. If loaf gets too dark before the center is baked, cover with foil. Store leftover bread on the counter. Loaf keeps for only one day. 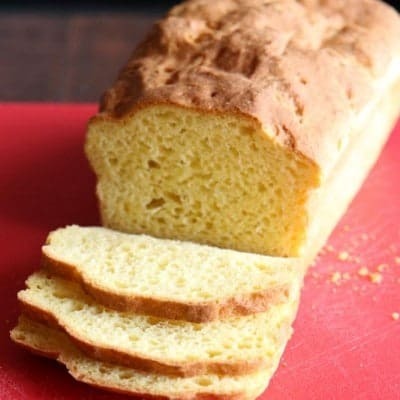 Replacing the gluten-free flour with a different flour can change the texture of the bread. If your mix does not include xanthan gum, add 1 teaspoon to the flour blend and whisk together with the flour before using.